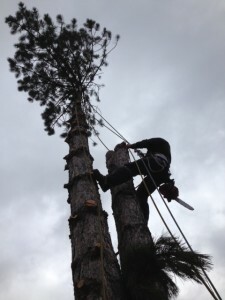 Sequoia TreeScape is the premier Newmarket tree removal service, serving our community and the surrounding area. Trees are a major contributor not only to the aesthetic appeal of your outdoor space but also to the air quality in and around your home. However, there are times when a tree needs to be removed, whether due to safety concerns, aesthetics, the tree’s health or storm damage. Ask us for a free tree removal quote today! Attempting to remove a troublesome tree on your own is a highly dangerous undertaking for the average homeowner. Even equipped with the proper tools, performing aerial tree work is a risk that can put you, your family, neighbours and property at risk. 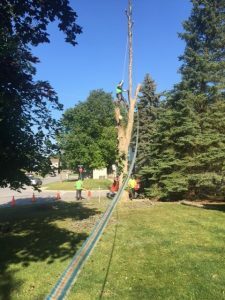 This is where Sequoia TreeScape comes in: a certified, insured and expert-trained tree removal team serving York, Durham and Simcoe regions from our headquarters in Newmarket, ON. We practice methods aimed at minimizing the risk to the property and people below, pruning the limbs and trunk into many small pieces and lowering them by ropes. We then bring in a stumping machine to grind out the stump up to 8 inches below ground, so that there is little to no evidence the tree was ever there. 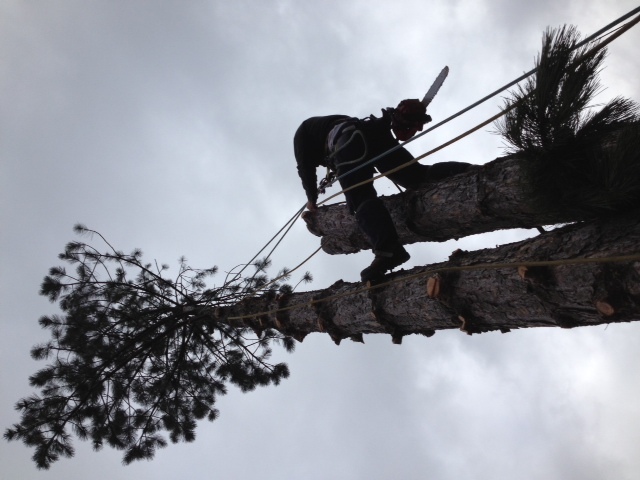 We will only “fell” trees shorter than 30 feet as part of our meticulous safety standards. Pine Trees – While the average pine tree grows to the height of 40 to 60 feet, some pines may be as tall as 80 feet. That’s why it’s important to consider obstacles such as power lines, plumbing pipes, surrounding structures and more during removal. Depending on the species of your pine, additional work may be required to remove pinecones and dense branches. To prevent the dangers of the sharp needles, extra safety gear must be worn. Oak Trees – The average oak tree can reach a height of approximately 60 feet; however, its strength and girth is the primary cause for concern during removal. Because oak is one of the strongest and thickest woods, the job at hand requires heavy-duty equipment to tackle it successfully. For this reason, removing an oak tree can be quite a costly endeavour. Large Trees – Maple, bur oak, and American ash trees can grow to heights from 80 to over 100 feet. Because these are among the longest living trees, the reason for removal can span anywhere from disease to storm damage to interference with power lines. Large trees are especially difficult to remove due to the scope and risk associated with work at such heights, and thus removal must be approached with special care and concern for safety. As the area’s leading tree removal experts, we also understand that each town or city’s forestry department has its own tree conservation by-laws, and we are familiar with the permit processes that are in place. If you are looking for tree removal in Newmarket, Aurora or the surrounding areas, please give us a call at 416-770-8733 or reach out through our online contact form today. The team from Sequoia TreeScape looks forward to ensuring that your tree removal – big or small – is a success!